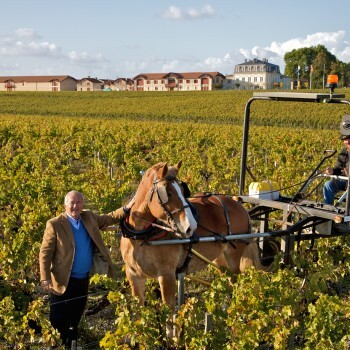 Pontet-Canet owner Alfred Tesseron is aiming to decrease the oak influence in his wines by becoming the first Bordeaux estate to embrace amphora maturation. “I’m tired of too much oak”, Tesseron told the drinks business during a dinner organised by Bancroft Wines, which aimed to show the stylistic evolution of the fifth growth Pauillac estate over the last two decades. Technical director Jean-Michel Comme, the man who inspired Tesseron to embrace biodynamic viticulture a decade ago, has spent the last three years trialling different sizes and shapes of amphorae, which are manufactured by the estate. As a result of these experiments, around 15% of Pontet-Canet’s 2012 vintage is following a small but growing number of respected producers around the world by being matured in amphorae. With 81 hectares of vineyard and an annual production of around 21,000 cases for its grand vin, the estate is among the largest classed growths in the Medoc. Although the concrete vessels are intended to provide a more neutral flavour effect than oak, allowing better fruit expression, Tesseron explained that amphorae of Cabernet Sauvignon contained gravel from the vineyard, while the Merlot amphorae incorporated a small amount of limestone and clay. Under Tesseron’s ownership, Pontet-Canet has seen glowing reviews and high scores, leading to an average trading price increase of £460 per case between 2009 and 2012. However, while the Liv-ex Power 100 ranks the estate at number 2 behind fellow biodynamic producer Domaine de la Romanée Conti, its analysis suggests the wine is still undervalued.